This article is about the race course from Mario Kart 7. For other race tracks with similar names, see Mario Circuit. Mario Circuit is the second course of the Flower Cup in Mario Kart 7 for the Nintendo 3DS. It is strongly based off the Mario Kart DS version of the track. In this, unlike the other Mario Circuit tracks, players can drive through Peach's Castle. 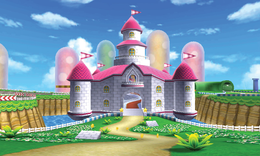 The track takes place on a large grassy field with sand roads, Mushroom Trampolines, pipes, blossoming peach trees, a lake, and Peach's Castle. The course starts on a small straight road and after two turns which a large curve with pink leaves appears. Then the player jumps off of a ramp, landing on a Mushroom Trampoline. Then a similar road to that of Mario Kart DS's Mario Circuit leads the way up to Peach's Castle. Then the road enters in Peach's Castle and, after a 270° turn up the spiral staircase, a glider pad enables the driver to fly out of the castle. Then a number of pipes appear that shoot out air, along with some Giant Goombas. A very long, large pipe similar to the ones form Mario Kart 64 and Mario Kart DS appears, in which drivers must drive through in a curve leading them back to a long road going back to the finish. After the first turn, players can use a Mushroom to hit a ramp to the right in the grass. Before Peach's Castle, there are some ramps in the grass. After gliding out of the castle, players can veer left and hit a ramp to save some time. Mario, Peach, and Yoshi glide out from Peach's Castle. In an early trailer of Mario Kart 7, when Mario Circuit was shown, there was originally a Mushroom Trampoline where the players glided out of the side of the castle, probably because the concept of gliders hadn't been implemented into the game. The blossoming peach trees in this track was later reused for the revamped Royal Raceway in Mario Kart 8. In addition, the falling flower petals from the trees are actually intended to serve as a 3D effect of the Nintendo 3DS. When the 3D mode is activated, the falling petals seem to "pop out" of the screen. This is the only Flower Cup course in Mario Kart 7 to not have a different name in PAL regions. This page was last edited on April 15, 2019, at 10:12.